Home Edu Events Quantum Sports Meet ‘Udaan 2018’ gives wings to a thousand students! Quantum Sports Meet ‘Udaan 2018’ gives wings to a thousand students! 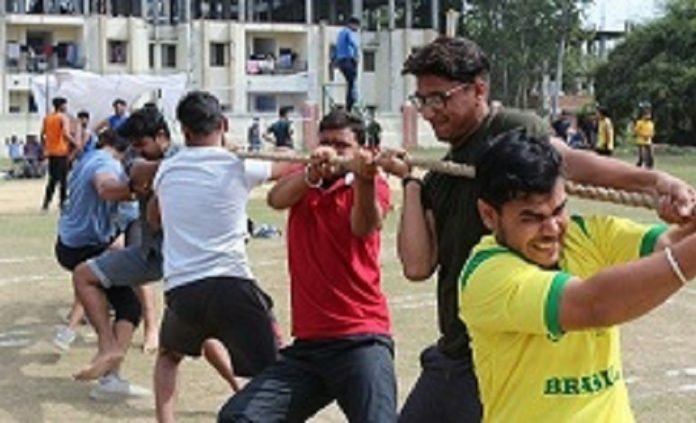 Mumbai: More than 800 students from Uttarakhand and neighbouring states competed in the two-day annual Sports Meet organised by Quantum University, titled ‘Udaan 2018’. The enthusiastic students participated in the competitions such as basketball, volleyball, tug of war, football, badminton, long jump. Several indoor games were also organised by the University in which the students showed their keen interest. A press release by Quantum University claimed the quartet of Ashish, Anuj, Aamir and Shubham clinched gold in 4X100m relay race while Azhar, Rishabh and Yogesh settled for the silver medal. In 400m race Vivek Tyagi from Civil Diploma won the gold while Shivam Kumar, from Mechanical Diploma, stood second. In long jump, B.Tech (Mechanical) student Siddhant won the gold medal while Himanshu from Civil Diploma attained the second position. B. Tech (Civil) student Anuj Sharma clinched a gold medal in the triple jump while Pratham Mittal from B.Tech (Mechanical) bagged a silver medal. The winners were conferred medals by the chief guest of the event.